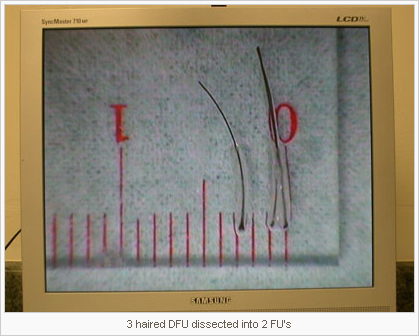 Dr. Keene utilizes double follicular unit (DFU) grafts in some areas to increase the density. This means fewer grafts yeild more hairs per sq cm. 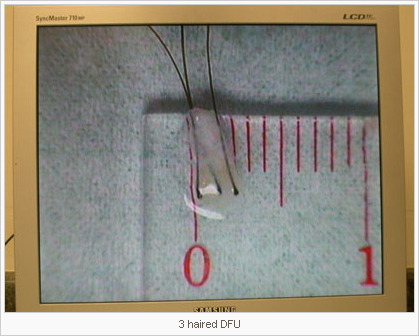 DFU’s are 3-4 hairs that consist of 2 follicular units, i.e. a small gap in between the hairs. But they look natural on their own, and are still tiny, less than 1 mm apart. Dr. Keene uses blades from .7 mm to 1.5 mm to create the recipient sites. 10 years ago the smallest blade size used in hair transplants to make the recipient sites for one haired grafts was 1.5 mm, so that shows you the advances that have been made in techniques designed to minimize trama, which Dr. Keene utilizes. If you look at a metric ruler you will see just how tiny that is. 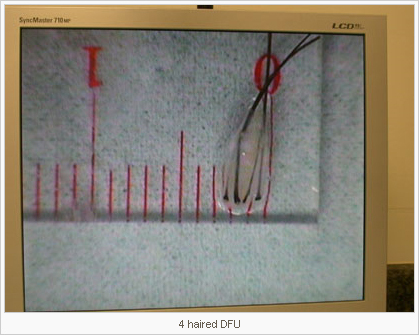 DFU’s have a slight gap between groupings, but can be placed just as closely together, or closer together, when not cut down into smaller follicular unit grafts. The advantage is that more density can be created with fewer incisions, which means a less costly hair transplant to the patient. 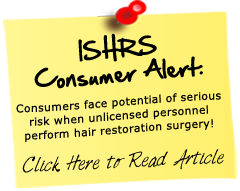 It also results in less trauma due to fewer incisions being required to place the same numbers of hairs. Dr. Keene focused solely on FU grafts for some time, but having placed DFU grafts prior, she soon realized that DFU grafts look just as natural in areas like the crown, while providing more density at less cost. Looking closely at the photos above, you can see that leaving a space between does not put the hairs closer together. Each tick above is 1mm. The DFU fits into a 1.5 mm flat incision. The FUs fit into two .7 mm flat incisions, with a space in between–the total of which is larger than 1.5 mm in distance. So more hairs can be placed into a smaller area utilizing double follicular units than solely single follicular units. Remember these photos are magnified to a larger size than actual, so if you want to see what 1 mm or 1.5 mm really looks like, look at an actual metric ruler–you will see that both are extremely small. Dr. Keene does not exceed 1.5 mm in size for the incisions she makes, and she customizes the blades and incisions to as small as .7mm, depending on the individual graft sizes. In the frontal hairline only one haired grafts are placed, but behind that there is a gradual transition to the use of 1 to 4 hairs per grafts mixed-if the hairs are within 1mm of each other, we consider it a follicular unit, but if they exceed that and are still within about 1.25 mm of each other we call it a double follicular unit. Using grafts of 1-4 hairs results in a completely natural appearance. In Dr. Keene’s opinion, there is typically a cosmetic advantage to using mainly more 3 to 4 haired grafts in the areas behind the frontal hairline, so she asks her assistants to focus on dissecting as many 3-4 haired grafts as possible. These are not mini grafts. We have been told by patients who have met with Dr. Keene that some other doctors have claimed she does mini grafts. That is not the case. Mini grafts were often 6 hairs and sometimes more, and would never have fit into the minute incisions Dr. Keene utilized today. Dr Keene stopped using mini grafts in the late 90’s. She focused on follicular units only for some years, but than realized that the addition of some double follicular units was advantageous due to her experience. The key is in knowing where the different types of grafts should be placed, and which patients will benefit from which size fu grafts. Patients with scar tissue from previous surgeries, or low density, may not group close enough together to allow DFU’s that are small enough. The patient must also have distendable skin to take sufficient donor. Only single follicular unit grafts are used in the hairline. 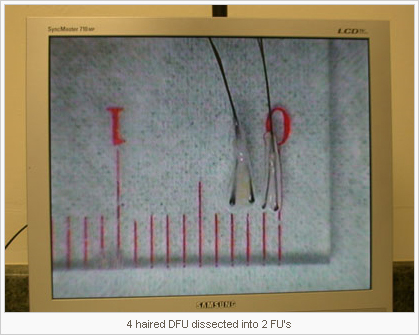 Experience and aesthetic ability in hair transplant surgery, along with technical expertise, allows Dr. Keene to determine where DFU’s are appropriate. Dr. Keene also offer Follicular Unit Extraction. For this, she uses a 1 mm or smaller punch to remove follicular units one at a time. There are no sutures, less healing time, and it is minimally invasive. While this procedure can be helpful for small areas of hair loss, Dr. Keene recommends the strip technique when a larger area of coverage is required. We are also not able to acquire many 3-4 haired grafts with the FUE technique, so it is a trade off. But for patients who have limited laxity which prevents more donor removed with a strip technique, and those who require less coverage, their can be advantages to the FUE technique. Neither is scarless, but if you heal well, it is more likely that you can wear your hair very short with FUE.